Hrabanus (Rabanus) Maurus, son of one Ruthard, was born probably at Mainz, about 776. At an early age he was sent to the Monastery of Fulda to receive a religious education. In 801 he was ordained Deacon, and the following year he went to the monastic school of St. Martin at Tours to study under Alcuin, a celebrated teacher of that time, who gave to Hrabanus the name of Maurus to which Hrabanus added Magnentius. 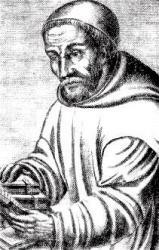 On his return to Fulda in 804 he became the head of the school connected with the Monastery. Towards him Ratgar the abbot showed great unkindness, which arose mainly from the fact that Ratgar demanded the students to build additions to the monastery, whilst Hrabanus required them at the same time for study. Hrabanus had to retire for a season, but Ratgar's deposition by Ludwig the Pious, in 817, opened up the way for his return, and the reopening of the school In the meantime, in 814, he had been raised to the Priesthood. Egil, who succeeded Ratgar as abbot, died in 822, and Hrabanus was appointed in his stead. This post he held for some time, until driven forth by some of the community. In 847, on the death of Archbishop Otgar, Ludwig the younger, with whom Hrabanus had sided in his demand for German independence as against the imperialism of his elder brother Lothar, rewarded him with the Archbishopric of Mainz, then the metropolitan see of Germany. He held this appointment to his death on Feb. 4, 856. He was buried first in St. Alban's, Mainz, and then, during the early days of the Reformation, in St. Maurice, Halle, possibly because of the opposition he is known to have made to the doctrine of Transubstantiation. With German historians Hrabanus is regarded as the father of the modern system of education in that country. His prose works were somewhat numerous, but the hymns with which his name is associated are few. We have the "Christe sanctorum decus Angelorum”; “Tibi Christe, splendor Patris”; and the "Veni Creator Spiritus”; but recent research convinces us that the ascription in each case is very doubtful; and none are received as by Hrabanus in Professor Dümmler's edition of the Carmina of Hrabanus in the Poetae Latini aevi Carolini, vol. ii. 1884. Dümmler omits them even from the "hymns of uncertain origin."